The Shire of Quintavia has discovered gold and more in our hills, and, while the Barony of Smoking Rocks has graciously “guarded” our mining operations for the last year, Quintavia has many neighbors who may wish to “liberate” us from this arrangement. The following is a partial understanding of the goings on that have happened in and around the Shire of Quintavia. February 13th, AS L, Carolingian Service University, Baron Colin of Carolingia and Citizen Ulrich von der Insel of Bridge begin plotting an alliance for the upcoming event. 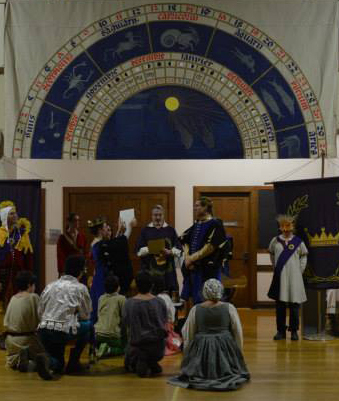 March 12th, AS L, Black Rose Ball, Clothilde and Ulrich usurp Baron Eloi, taking control of the Barony of the Bridge. 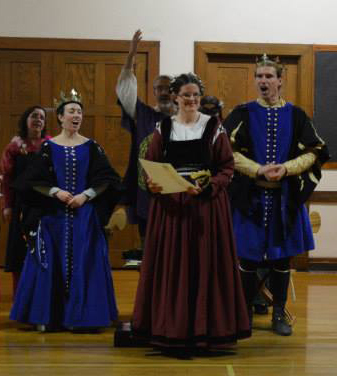 Word of the growing tensions in the Central Region is overheard in Royal Court. September 3rd, AS LI, Smoking Rocks Baronial Investiture, the Dread Baron Richard Leviathan leads his forces to seize control of Quinatvia’s gold mines, allegedly in an attempt to block Carolingia from doing the same. September 17th, AS LI, Falling Leaves in Exile, Carolingia pledges to overthrow Smoking Rocks’ intolerable interference. February 18th, AS LI, Ice Weasel 12, Quintavia pays tribute to Smoking Rocks. March 11th, AS LI, Novice Schola & Birthday Feast, Bergental pinky swears to come to Quintavia to combat Smoking Rocks’ aggression. What’s more, our miners have recently discovered a magnificent stone that glows with an inner light. 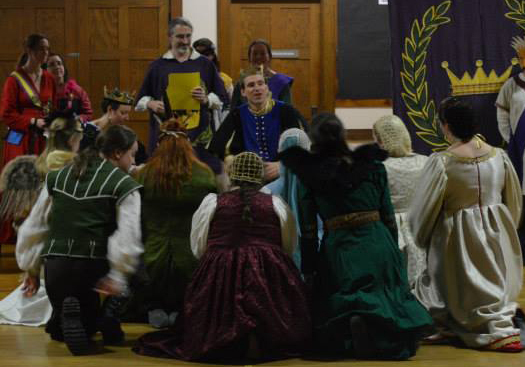 There shall be competitions and Melees in all of the combat arts(Heavy List, Fencing, Archery, and Thrown Weapons), A&S challenges for artisans, War Points specifically encouraging Youth participation, and even a riddle contest. In addition, Dancing and Feasting (Please pre-reg!) will be had by all. Finally the Shire of Quintavia invites one and all into a party at their encampment the Friday night of the event. The site does have tenting facilities, please Pre-Reg to ensure spaces. As part of the event Households in about Quintavia have issued challenges with the winners receiving renown for there the Baronies. The Defender of Quintavia shall be chosen from among those residents who present anything green and white, or green, or white. This is to represent the shire colors. Hurrah for the green and white!! Long may our banner wave! Duke Edward and Mistress Cassandra wish to see your practical garb. Whether for smithing, nursing, cooking, plowing, or viking, show off your plain, stained, efficient, or comfy garb. Countess Svava encourages one and all to engage in Viking Embellishment, whether in trim, embroidery, carving, or storytelling. Bring your finest flamingo festooned forms for display Saturday and earn your Barony the Darostur War Point (and maybe some gracefully awkward prizes). House Viborg is sponsoring a Dirty Dozen Largess challenge! Each entrant must make 12 items of largess to be given to the Crown. There is no limit on the number of entries. These can be sets of the same item (12 pairs of earrings) or a suite of items to showcase the breadth of an artist’s talent. More information can be found at the event website, including the pre-reg form. All are invited to come support the Shire’s neighbors in their bids to see which Barony shall earn the right to bear the Arkenstone! This event is co-sponsored by the Shire of Quintavia, the Barony of Carolingia, and the Barony of Bergental, please do come. The Shire of Quintavia is pleased to once again host the Keepers of Athena’s Thimble at our second Embroiderers’ Schola! As the wind blows cold and the snow lies deep, come join us by the fire for a day of artistry and learning. This event will be a day of classes and good conversation focused on the art of the needle. Classes will be held on all forms of embroidery and needlework. All embroiderers are encouraged to bring their work to add to the display of needlework, and to present at the guild panel at the end of the day. There will be a potluck lunch held mid-day. The event is donation only, no set fee. Anyone interested in teaching should contact the Guildmistress of Athena’s Thimble: Mistress Briony of Chatham. Classes can be 1, 1.5, or 2 hours long. One classroom can easily be made dark enough for slides. For more information, please see the event announcement. Item. Their Majesties called into the Court Dove Galea and caused her to be inducted into the Order of the Tyger’s Cub, the which deed was commemorated in a document by Katherine Stanhope. Item. Their Majesties called into the Court Markis Galea and caused him to be inducted into the Order of the Tyger’s Cub, the which deed was commemorated with a document by Aleksei Dmitriev. Item. Their Majesties caused the judges of the day’s costume contest to announce the winners of said contest, and give prizes to the said winners. Item. Their Majesties called into their presence Úna inghean Chonaín and awarded her Arms, the which deed was confirmed in a document created by Constance de St. Denis. Item. Their Majesties invited into their presence newcomers to the Society and gave the m tokens of welcome in memory of the day. Item. Their Majesties gave public thanks to the musicians who had performed for the dancing. Item. Their Majesties gave public thanks to the cooks who had diligently worked in the kitchens all day so that those dancing might be sustained throughout their efforts. I, Donovan Shinnock, Golden Rapier Herald, wrote this to memorialize and make certain all such things that were done and caused to be done as above stated. Greetings from Quintavia! Once again this year we will be hosting Hrim Schola, the East Kingdom’s premier fiber arts learning event. Last year we had ten tracks of five classes on a wide variety of topics sprinkled with guild meetings, and this year we hope to have even more! 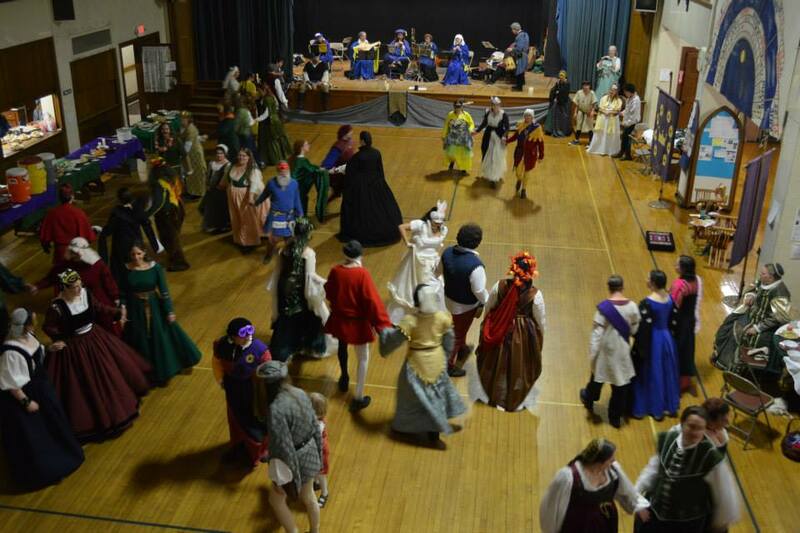 The event is on March 23rd in a new site in Clinton, MA. 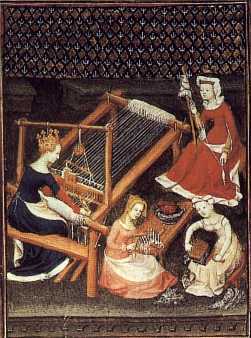 The overall theme for Hrim Schola is the fiber arts, and we usually have classes on spinning, weaving, dyeing, sewing, embroidery, clothing construction, knitting, and more. Every year we have a featured track that usually includes things other than the fiber arts. This year our focus is on Accessories; this could be hats, belts, shoes, jewelry, stockings, laces, really anything that goes with an outfit – and armor is an outfit, right? We will also continue last year’s popular Youth track, so we will have classes for all ages. If you are interested in teaching at this event, please contact our Chancellor, Rosina von Schaffhausen. We will have space for messy classes in a commercial kitchen, and if you need a huge space and don’t mind the chill, there’s an unheated gym. The site is only partially handicapped accessible, so please mention if you have accessibility needs, and we will organize the class schedule accordingly.